The American Research Group has now released the polls it took in every state plus D.C. so for the first time we have a recent poll in every state. Not all of the spreadsheet entries use the ARG poll because, as explained yesterday, the most recent poll wins, where the middle of the polling period determines the date. In some states other polls have come in since the ARG poll in that state. So what is the result of all 50 states having recent polls? Today's score is Kerry 255, Bush 273, a small lead for Bush and just barely above the 270 votes in the electoral college. But with a dozen states in the tossup category, the race is still a tie. But wait, there are two polls on the spreadsheet that are virtually certain to be badly wrong. Maryland is an exact tie now. But if you look at the graph for Maryland, it is clear that Maryland has been strongly for Kerry for months and Democratic for years. Bush has no more chance in Maryland than Kerry does in Alabama. 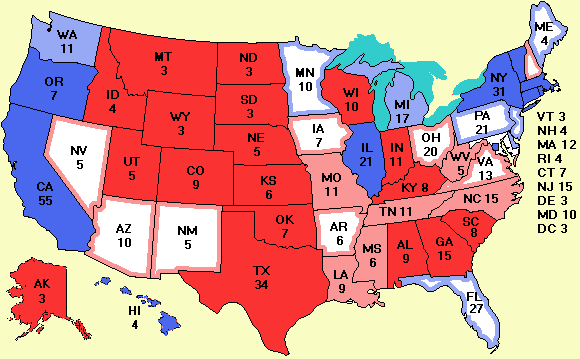 So if we assign Maryland to Kerry, the score is then Kerry 265, Bush 273. Seems like a clear, if small, Bush victory, no? Well, not so clear. Consider Colorado. A small and relatively unknown polling firm, Ciruli, has announced that Bush is ahead in Colorado by an implausible 55% to 39%, a 16% lead. There have been six polls since Aug 16 in Colorado, every single one of them had the race either exactly tied or one of the candidates was ahead by 1%. Even the Republican polling firm Public Opinion Strategies had Bush only 1% ahead as recently as Sept 13. Assuming the folks at Ciruli just made up some numbers, and Bush is ahead by 1%, everything depends on the Colorado referendum to split the electoral vote proportionally to the popular vote. Fortunately, a poll has just come out on the referendum and currently it looks like it might just pass. If Bush is 1% ahead in Colorado, he would get 5 votes in the electoral college and Kerry would get 4, changing the score to Kerry 269, Bush 269. If West Virginia Bush elector Richie Robb votes for a Republican other than Bush, as he has threatened, then the score becomes Kerry 269, Bush 268. In both cases the election is decided by the new House with each state getting one vote. In all scenarios, the Republicans will control the majority of delegations in the new House, so the House will elect Bush. Depending on who controls the Senate, Cheney or Edwards becomes vice president. Could go either way. If the Democrats hang onto the Louisiana Senate seat, as they have for over 100 years. there is a good chance the Senate will be split 50-50. In that case, Cheney gets to cast the deciding vote. I have not changed the spreadsheet to reflect a possible split in Colorado because it is a bit early to say the referendum will pass. Also I have not split Nebraska because Bush will surely carry all the congressional districts and I have not split Maine because Kerry will certainly carry the southern one and probably the northern one as well. As time goes on, these decisions will be reevaluated. In any case, we have a real horse race again. The debates will probably be crucial. For once, a discussion of the issues may decide the election instead of all the mud we have had so far. Juan Cole, a professor of history at the University of Michigan, has written a short, but riveting article translating the war in Iraq into American terms. It is very sobering. Well worth the five minutes it will take to read it.